I enjoyed this book when it came out in hardback two years ago so it is good to see it available in paperback. 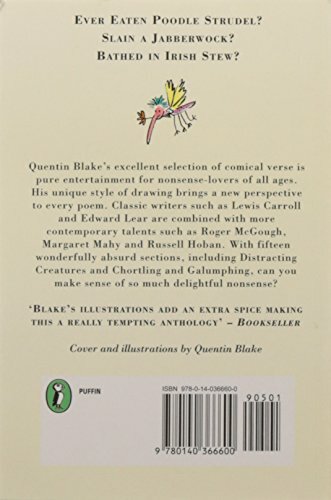 Blake proves himself to be more than an outstanding humorous artist; his short Introduction shows a discriminating understanding of the nature of nonsense verse and the links between writing and illustrating humour. His selection of nonsense is similarly well informed, including plenty of humorists from the past (Hood, Lear, Carroll, Rands, Hoffman, Belloc et al). (Interestingly, few women choose to specialise in this genre.) Blake's own black and white line drawings feature on most spreads. His illustrations are as original, lively, inventive and hilarious as ever. One of the best books of comic verse on the market.